Yesterday was a great day, especially for Ray. He ate up every single 1 and 11 of the day... and has the documentation to prove it. Ray's gas-mileage odometer also rolled over 111.1 miles yesterday. A good sign indeed. I. One Sunday when Ray and I were dating, we went for a walk down to the Ballard boat locks so we could watch all the boats get elevator-ed between the Puget Sound and Lake Union. While we were looking at the boats I asked Ray what he would someday name his boat (when he got one). He didn't even look over at me. He just kept watching the boats and in a monotone voice said, "you don't even need to ask. You already know the answer." I quickly started scanning my brain trying to recall if we'd already had this conversation in the past. When I felt confident we hadn't, I fixated on the idea that maybe he was suggesting he would name it after me. I was suddenly sure that was what he meant. I couldn't decide whether that made me feel good or weird. THEN, it dawned on me... he wasn't suggesting he would name his boat after me. I looked at him and said, "you'll name it Eleven-Eleven, huh?" He said, "yup." Later that night I would declare I loved him for the first time. He would get mad at me and say I 'd stolen his thunder because I said it first. I would tell him I got tired of waiting and couldn't hold it in anymore. II. Ray still wakes me up occasionally at 11:11pm to kiss me and say, "I love you. Happy eleven-eleven." Then we both fall back asleep. III. Last night (when I got home from the hospital and Ray got home from a full day of snowboarding in Utah for work), we got out our Sake cups, filled them with orange juice, waited for 11:11pm to arrive, and toasted to our happiness. We even figured out how to set the timer on the camera so we could document it. Ray and I both home from a LONG day of work and taking a picture to document 1-11-11 as a day in our lives. Toasting and trying to figure out the camera timer. The alarm clock between us says 11:11. Toasting in front of the other clock in our house that still said 11:11... after missing Ray's head in the last shot. Two-thousand and ELEVEN is going to be a great year. My favorite 11:11 memory of Ray is when he makes sure you KNOW it's 11:11. This is usually done with me by grabbing my head and showing me in a, what I hope is, less gentle than your kiss kind of way. Happy 11. My favorite 11:11 memories of Ray are when he texts me with an 11:11 message in it. Because of Ray I am reminded the Lord is in the details. So funny because you two are all I thought about yesterday! And all because a friend of mine texted me to say Happy 1-11-11! Eleven will never be the same! Thanks a lot Ray. I KNEW Ray and I had a special connection! My favorite number is 11, too, probably because my birthday is on January 11. Most of my favorite sports figures wear the number 11 (check out Matthew Bryan-Amaning for instance) and I, too, wore that celebrated number for my track team in high school. Why does Ray love it so much???? When Ray read your comment tonight he said (and I quote), "it isn't so much Ray loving eleven... it's eleven loving Ray." I guess eleven picked him. Happy birthday a day late. 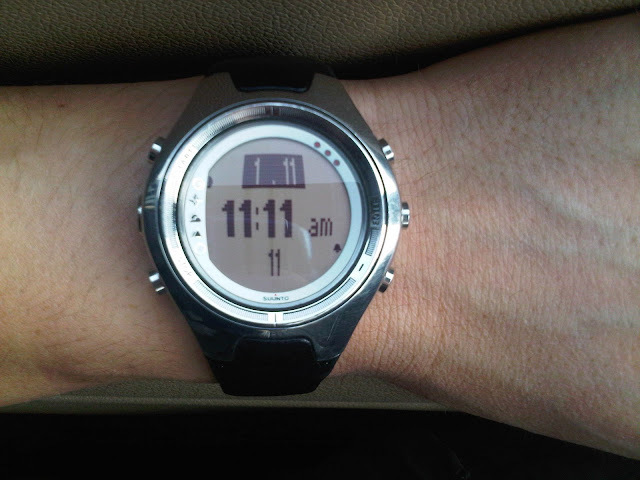 Just wait until it's 11-11-11, at 11:11. What a fabulous day that will be! I love your life chronicle. But where did this 11/11 fetish happen? I love it. When my nephew was born on November 11th, 2000, I remember thinking how cool it would be that he would turn 11 on 11/11/11. I thought Ray could appreciate the awesomeness of that.